James Mackrel (65) Richard Bird (57) Jason Meara (10) Robert Hamilton (3) and John Meara (60) power through turn two at Tandragee MX1 race. Twenty-one-year-old Mackrel on the Lyons Bro’s Peugeot Yamaha won all three MX2 races. He had a comfortable victory in race one over Dubliner Jake Sheridan on the RsR Plant Service KTM but in race two and three he was pushes all the way by Co.Meath KT Racing Kawasaki rider Jordan Keogh who finished 0.313 seconds behind the winner in race two then in race three less than half a second covered the top three at the line with Sheridan completing the rostrum on both occasions. After winning the opening MX1 race on the Edgar Electrical KTM with a hard charging John Meara on the Watts Motorcycles 450 Kawasaki a close second. Mackrel had to settle for second best behind the Meara brothers from Loughbrickland in race two and three. Race two was one of the best MX1 races for many years with Jason Meara and Mackrel neck and neck in the closing stages before Meara made his winning move on the final lap to win by over four and a half seconds in the end. John Meara made amends for his mistake in both race one and two by taking the hole shot in race three and winning by nearly eight seconds. Mackrel was second again with reigning MX1 champion Richard Bird taking his third podium of the day on the Five5 motorsport/ Watts KTM. “It would have been nice to have won all six but I suppose you can’t win them all,” said Mackrel. ““It was hard jumping from the 450 KTM to the 250 Yamaha and it took a couple of laps each time to get in to it and by the time I got to the last race I was ready for a sleep. “I had a stomach bug all weekend but that’s not an excuse as in the second MX1 race Meara and me had a good battle. New championship leader John Meara summed up his day saying. “I need more of that last race action. I made the hole shot and just walked it. The speed is there but a few things didn’t go my way today. Jason Meara who was involved in that epic race two said. “I made a good start to race two but was held up from the leading group for a couple of laps and by the time I got past I really didn’t feel I had the pace to win. “As the race went on however Mackrel was coming back to me. I made a clean pass before the last lap then he passed me back. I got back in front at the top of the hill then he had a real go into the right-hander. “My race craft paid off in the end. I made a mistake in race one and in the final race I just couldn’t get going. No excuses. 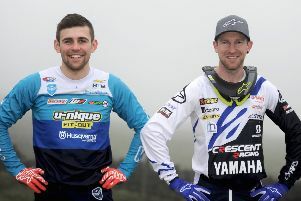 Jack Daly won the MX1 Semi Experts while Connor Mullan won the MX2 Semi Experts. 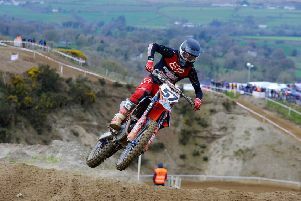 Terence McGlone and Eoin Duffy took the honours in the Clubmans MX1 and MX2 respectively. The veterans class was dominated by Mark Mooney on his Yamaha.